In “The Yellow Face,” Sherlock discovers that a mysterious child is the biracial daughter of an American woman now married to an English gentleman. You know that dreadful feeling. A friend encourages you to read a classic novel, the one written over 100 years ago, the one you feel like you should have read already. But… it’s gonna feel “dated,” right? There’s that bloated, purple prose that lumbers across the page until your eyes glaze over. And the hokey way characters wear disguises at parties only to reveal themselves with a vindicated flourish—aha! It’s me, Rochester! Not a fortune-telling old woman! But this dread you are feeling is deeper, and it means something. It’s because you know that eventually these colonial-era characters are gonna say something racist. And you’re going to wonder, should I even be reading this anymore? I am here to tell you… that I cannot answer that. Sir Arthur Conan Doyle, I learned, is complex on this issue of race. Of course, the Sherlock Holmes stories were not written for the modern reader. Most were published in The Strand magazine in the 1890s and were meant for popular consumption—they are a reflection of the times. And as we well know, the reflection of Victorian England—colonial England—is not of a culture built on ideas of equality. There are moments of clear progressiveness in the Sherlock stories. In 1891, Conan Doyle wrote an indictment of the Ku Klux Klan in his story “The Five Orange Pips,” portraying the KKK rightfully as a terrorist group who committed “outrages” against African Americans. In “The Yellow Face,” Sherlock discovers that a mysterious child is the biracial daughter of an American woman now married to an English gentleman. The woman does not want her husband to know she was once married to a prominent African American lawyer in Georgia who died. 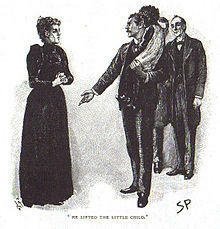 In the moving final scene, however, Watson and Holmes are gladdened to see the English husband pick up the child with affection and acceptance. The story was published a full 74 years before interracial marriage was legal in the United States. However, critics will also point to Conan Doyle’s cartoonish depiction of a boxer in “The Adventure of the Three Gables,” and of the negative portrayal of a Chinese man in “The Man with the Twisted Lip.” This, to me, may not be evidence of Conan Doyle’s assumed views on racial superiority, but rather of his being a product of a racist society. Were he alive and writing today, would he have been more sensitive to racial depictions? I’d like to be an optimist and say yes, he would have. It is uncomfortable, and for many of us traumatizing, to discuss this stuff. I believe that the most important cultural contribution from our current time will be that we are finally, on an everyday level, wrestling with the racism and misogyny in our artistic heritage. Should we erase the past and start over? Some say we should. I don’t agree with them, but I certainly understand. But that is just me. Racism impacts us all on so many levels, and the richness of a book club is the different perspectives we bring to it. You as a reader will see things that I missed. If you are able to read and contextualize these ignorant portrayals and celebrate where we have come since then, good. However, if they make you feel angry and uncomfortable, or you simply don’t want to entertain the garbage of the past—that’s fine, too. I believe in reading what you want, how you want. This is tough stuff, and none of us have hit upon the perfect solution for it. This is Leslie VonHolten of Lawrence for the HPPR Radio Readers Book Club. Find more at hppr.org or Like us on Facebook.